Right, that's a fire extinguisher. In my kitchen. appreciate that you were thinking that. Bodine, benevolent ruler of Sword House, has commandeered the dog bed. A silent and bloodless takeover of prime real estate, which has left Micron to rest his weary bulk upon the kitchen tile. To the left are three steps that lead down to the back door. Micron's head is pretty much hanging there in a passive-aggressive statement of his discontent. I'm suffering here, Bodine, says Micron. Takin' one for the team. Uh, Bodine looks, as if to say, "It's mine. It's all mine...now back off!" That's a great shot! Very cute. 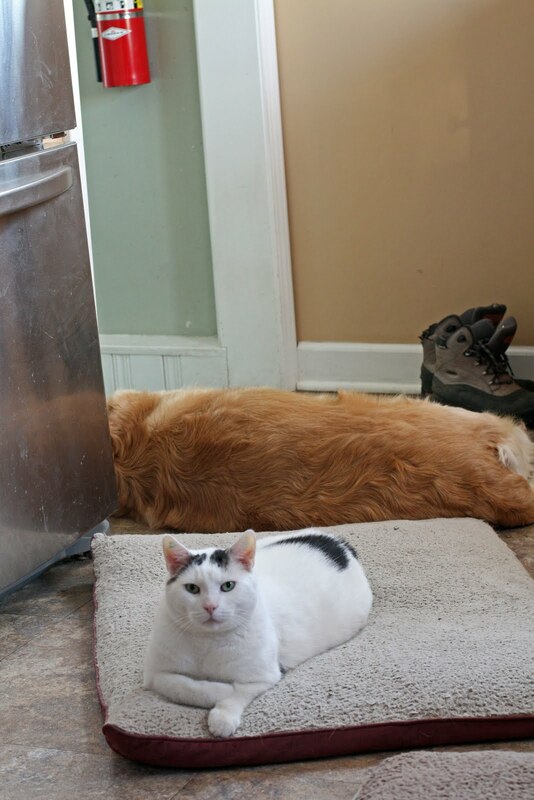 Cats always rule and the sooner the doggies learn that, the happier they can be!